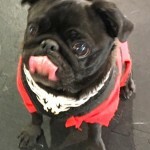 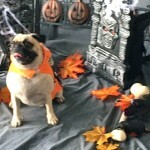 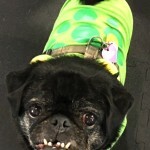 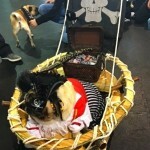 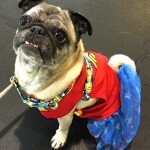 Pugalug Pug Recuse‘s Annual Pugoween Halloween party at Purina Pawsway in Toronto was amazing! 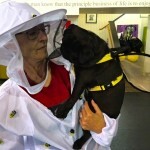 Thanks to all of the wonderful volunteers, staff and attendees that made this year so great. 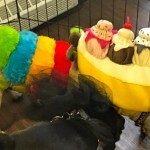 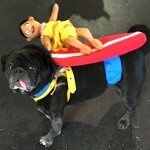 A Grumble of Party Pugs came dressed in their Halloween costumes to help support the Pug Rescue, socialize with friends and of course, show off their costumes. 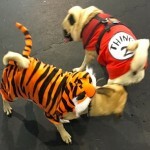 It was non-stop action with little pugs running everywhere. 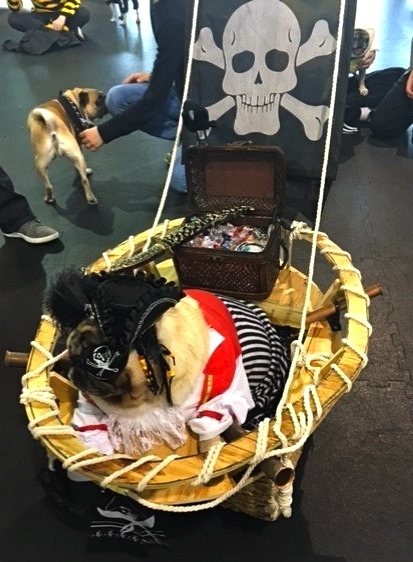 My husband came and sat with Kilo in a quiet corner up on a bench. He was actually pretty happy watching the fun from a safe distance. 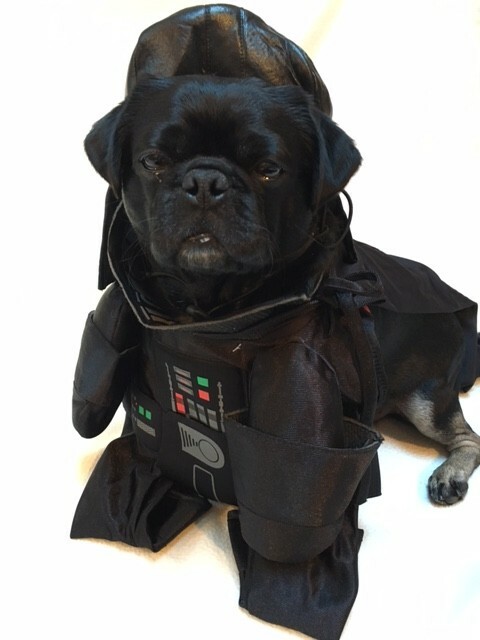 He wore his Darth Vader costume for about five minutes but I didn’t want to stress him and he is happier naked in just a harness. 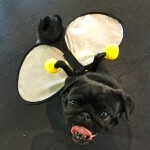 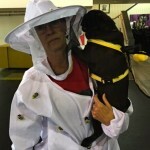 Pugalug’s Blanche Axton’s Bee and Bee Keeper partner costume with her pug was very creative! Each year this creative family always comes up with great new ideas for the Halloween costume contest. 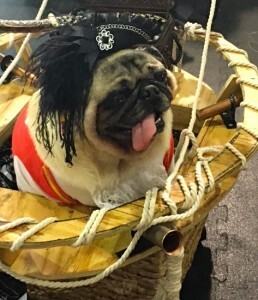 This year their adorable pug was a pirate complete with a ship and of course treasure. 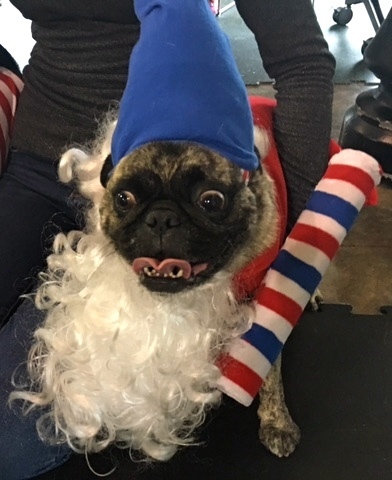 Second place went to Waldo and Pumpkin for their elf costumes. 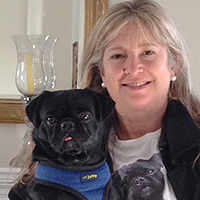 Pugalug Pug Rescue is a registered charity that helps to bridge the gap between a pug’s past life and future. 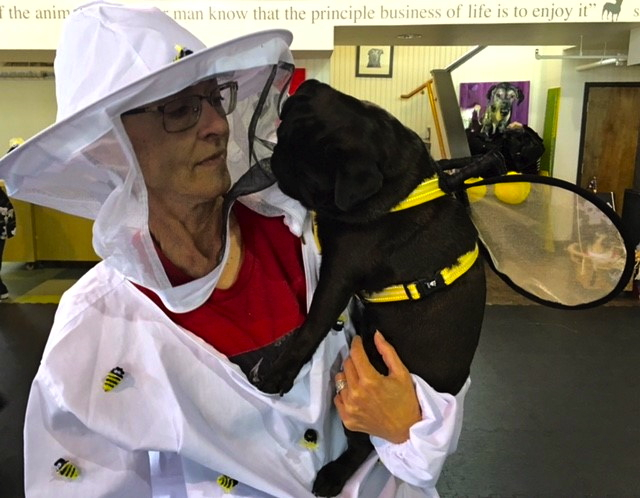 A team of dedicated volunteers work hard helping rescued pugs by providing them medical care, love, comfort, food, and companionship while they look for a forever home. 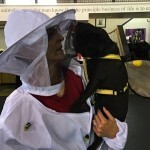 I have supported them for years and think they are a great rescue that does amazing work. 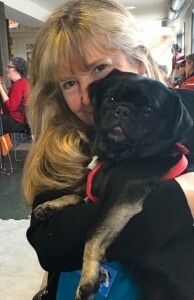 If you are looking to get a pug, I urge you to do your research about the breed then consider adopting a rescue. 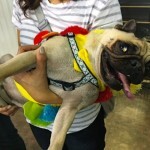 Read Our 10 Questions To Ask Yourself Before Adopting A Pug Post Here. 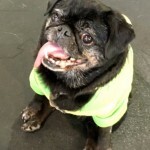 Support Pugalug Pug Rescue and purchase our pal, Igor Pugdog‘s adorable calendars. 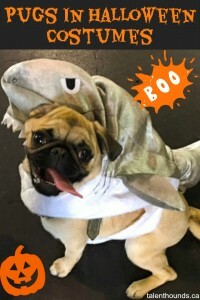 Order yours for only $15 by emailing: igorpugdog@gmail.com. 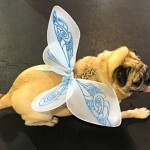 Share your Photos of Your Pug or from the Event. 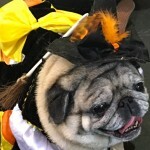 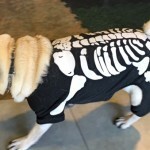 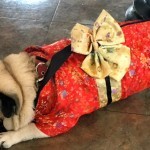 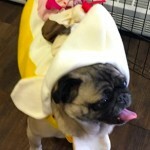 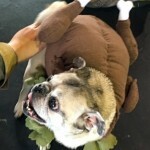 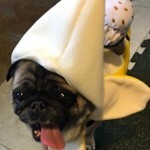 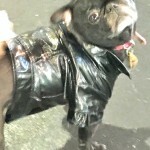 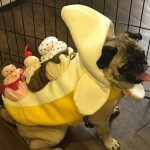 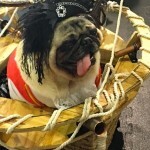 Enjoy Photos of Pugs in Halloween Costumes!